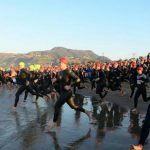 Through dozens of triathlons, we’ve compiled this quick list of triathlon open water swim tips. These are tried and true focus areas, based on actual experience. This list could be pages long, but we will try to make it focused so you only have a few things to remember. Your race likely will not be as large as this Ironman full wave start, but you probably will be in the water with other people. 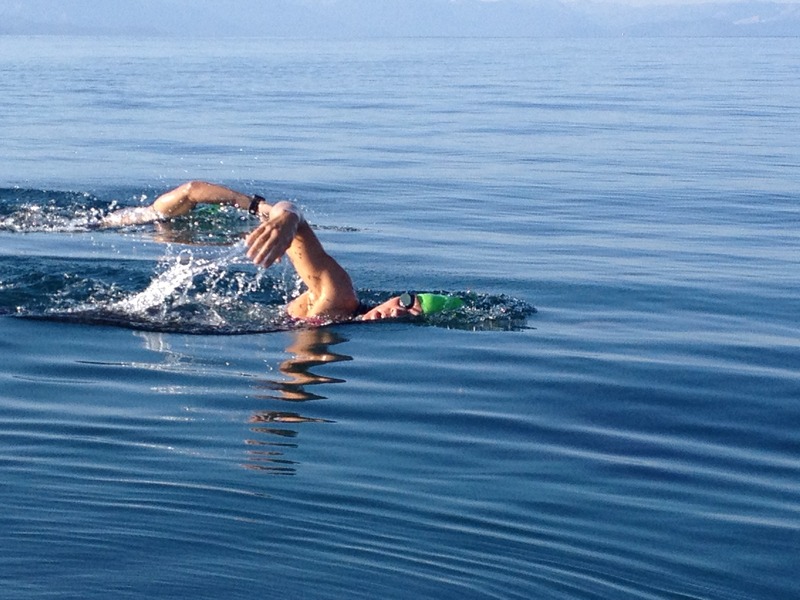 Open water swimming is not like swimming in a pool on many fronts. The water can be colder, the water can be cloudy or dirty, there is no nice line to follow on the bottom of the pool, there could be waves, and you will be swimming with others in a bit of a free for all. Getting in the water to do an open water swim or two prior to race day is important. It doesn’t have to be a major event – one way to practice is to simply swim laps around the swimming area of a local beach (preferably in the morning before it is busy with kids). Better yet, if you have a group you can practice with, try going for a swim in some larger water. Finally, a great way to get in the open water if you don’t have access to a large group is to at least have a friend kayak or paddle board next toy as you work on your swim stroke. At any rate, be sure you are practicing in race conditions. We know that swim workouts are probably an important part of your training plan — but make sure that swimming in open water — if that is where you race will be — works its way into your training plan during the latter weeks of your training period. Triathlon wetsuits help with both buoyancy and warmth in the water. They provide a natural level of flotation that allows you to skim over the water more easily while keeping you warm at the same time. The general rule of thumb is that in water temps of under 70 degrees, the warmth from wetsuits can be very beneficial. Between 70-78, wetsuits are viewed as optional (the sleeveless models are more popular in this range). Above water temps of 78, wetsuits are not recommended as they can cause you to overheat. 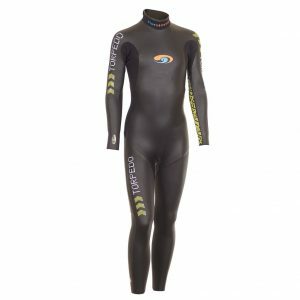 Even if your goal is not to do a triathlon, but simply to swim in an open water race or event, you will want a triathlon wetsuit. Regular wetsuits are intended more for surfing and don’t provide the range-of-motion of a triathlon wetsuit. If you plan to use a wetsuit, we highly recommend — implore you, really — to practice with the wetsuit at least once before the race. Practicing several times will be even better. Wetsuits can feel a bit different at first, and sometimes give the sensation of being tight or restrictive. We have seen many triathletes not realize this, only to have a difficult race morning, or in some cases not finish the swim. Practice putting the wetsuit on, swimming with it, and taking it off. It isn’t rocket science, but it is just different enough so that it will have been good to have practices. If you buy a wetsuit, make sure it is one designed for triathlons and open water swimming. Swimming laps in a pool can be monotonous after a while, as you follow the stripe at the bottom from end to end. In open water, though, you are typically “sighting”, which means you are lifting your head up periodically to fix on a point of reference. That point is usually a buoy in the water but can also be a feature on the land. Sighting is not a natural motion and should be practiced. A couple sighting tips are to find something on the land to fix on, not just buoys (you can then have a more consistent focal point) and to use good quality goggles. A secret of many experienced open water swimmers is to always use brand new goggles on the day of the event. They will not fog nearly as much as older ones. You can save the older ones for your pool swims. The combination of a foggy goggle and a sun glare can make sighting very difficult. You can also sight based on swimmers next to you – just stay in the pack – but it is still a good idea to occasionally sight for yourself. Keep your head down. This is harder to do when sighting, but still important. Don’t be afraid to put your face in the water. It is the only way to have good swim posture. Lift your arms out of the water on the stroke. It can be easy to get lazy when reaching forward, but you want your reach to be nice and clean. Kick. You don’t need to kick terribly hard, especially if you have the buoyancy of a wetsuit. But some level of kick will keep your body feeling the way it did when you were training in a pool. It also helps create the body roll you need for a nice swim rhythm. If there is one word that best describes the goal for a beginner triathlete in open water, it is “relax.” Relaxing means finding a lane at least a couple feet away from the pack so you don’t feel boxed in (although the first 100 meters of any open water swim are usually in traffic), getting into a rhythm that reminds you of your swim training pace, and getting to a point where you really get a good reach going. That feeling of fully stretching out and getting into a nice tempo is the point when many experienced triathletes will say they feel like they have relaxed. It often takes a couple hundred meters to find that feeling. Just keep focusing on your breathing, taking consistent, deep breaths in and out. If your breathing is relaxed, the rest of your body and mind will follow. There is no substitute for being in great swim shape. 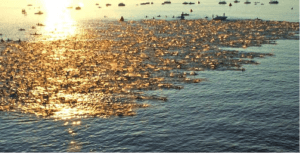 Be sure you have trained for your open water swims. If your open water swim will be 800 meters, become good at swimming 1,000. If you want to do a 1 mile swim, work on being able to do 2,000 meters with ease. Because of the sighting issue, many open water swims end up being longer than the exact advertised distance because you tend to zig-zag a bit. It is rare to swim in open water in a perfectly straight line. Also, knowing in your head that you can easily do the race distance will allow for a mental edge if you find yourself unrelaxed at first in the water. If you are able to train in open water a few times each season (which we recommend above), consider getting a waterproof triathlon watch capable of being used during the swim. This will give you an accurate, GPS-based reading on exactly how far you are going in your open water swim workouts. Getting out of the water after a colder open water swim can be a little different than exiting a pool. You will often find that you are dizzier, as the colder water in your ear canal can impact your eustachian tube function, and the up-down, side-side motion of water is a little different than stepping out of a pool. Take it slow at first, and get used to the feeling of working off the dizziness. This is also a great time to practice removing your wetsuit, if you use one. 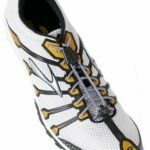 If you found this useful, be sure to check out some of our related work designed for newer triathletes. Some of our favorite pieces right now include Beginner Triathlon Wetsuit Tips, a new article on how to find a good entry-level triathlon bike, and our definitive guide on triathlon shorts. All are geared toward triathletes of all abilities.